Earn $14.72 in Rewards credit. Click to learn more. The S2 builds off of the 100% Speedcraft's legendary success in cycling's biggest races, worn by some of the top riders. Featuring a more refined design, the S2 features innovative technologies and an optional HiPer Lens, making these glasses equally useful on the bike, on the run, or just in daily life. S2’s laser-etched edging provides the look of a full frame in a rimless cylindrical shield, for 360º visibility and comfort. Available with standard or HiPer lenses, the S2 comes in a variety of frame and lens colors to match any style. With the large HiPer Lens, the S2's ramp up contrast and colors, enhancing the minute details of the road for safer riding. Selective filtering rays that increase detail and definition, the S2's offer greater depth perception with sharper, clearer peripheral vision. With the Hydroilo Lens Coating, the S2 repels oil and water, while the Ultra-Grip Rubber nose and temple tips keep the S2 secure. 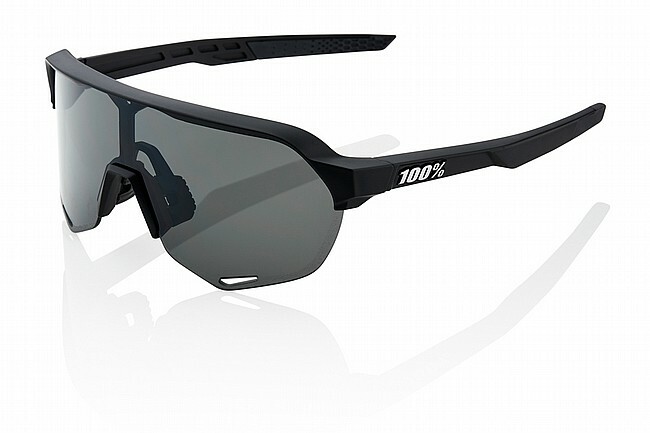 The Ride 100% S2 Sunglasses includes a spare Clear lens and alternative fit nose piece. Cylindrical Shield design offers unobstructed 360º visibility. 5.5 Base ensures a superior, comfortable fit. Ultra-Grip Rubber nose and Temple tips for a secure fit. HiPer lens version increase contrast, color, and detail. I bought these because they look so badass. Great field of view due to the ridiculously awesome large lenses. The optics are very good, not phenomenal. Can't change lenses without smudging, but with good quality wipes it's easy to clean them up. Decent sunglasses if you don't to have the same pair as everyone else. Decent glasses but not really worth the price tag it commands. Both the S2 and Speedcraft are unique, however, build quality and optics are far behind Smiths and Oakley. I liked the color scheme and look of the glasses but in the end they don't fit on my face properly and there is no peripheral vision. My go to pair are still the Oakley jawbreakers. no glare and can read my computer without taking them off.